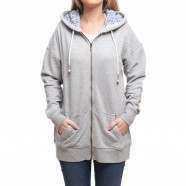 Roxy Hoodies - Roxy New Signature Zip Hoody - Light Denim :: Women > Hoodies. Women's hoodieFull-length zip fastening at the frontSoft 235 g/màâ€š² terry fabric is comfortable to wearRib-knit sleeve cuffs and hem help to seal in the heatHood is comfortable to wear. and is adjustable using the drawstringsPouch pockets at the frontSubtle branding: just a small half-moon logo on the left wristMaterial: 59% Cotton. 33% Polyester. 8% Viscose Size: 12,06,08,10.